The other week, when in Henley in England, I spoke to an English couple from Exeter who had recently visited Dublin. They loved the city but said that they didn’t do any shopping because the place was far too expensive. They couldn’t understand how a country suffering from 14% unemployment and emigration, while the domestic economy was on its knees could have such expensive retail prices. They put it down to the Euro and they were mostly right. If we had a currency commensurate with our weakened economy, that currency would have weakened dramatically from 2008-2013 to reflect the collapse in the domestic economy. This devaluation would have helped Ireland to become more competitive again quickly. Wages and prices would have fallen dramatically making Ireland a fantastic place to invest. But that didn’t happen. The English tourists had a good time, but didn’t spend what they had intended to because the country is too expensive largely as a result of trading in a currency, which is far stronger than the weak Irish economy can sustain. If the tourists had been Japanese and found Ireland expensive that wouldn’t be too bad, but they were English and the English are our biggest source of tourism. This is why the exchange rate with Britain matters hugely. Our economy is going backwards. Latest figures from the CSO reveal that the economy has shrunk since last summer. We are now contracting at a pace last seen in 2009, when the wheels really began to come off. 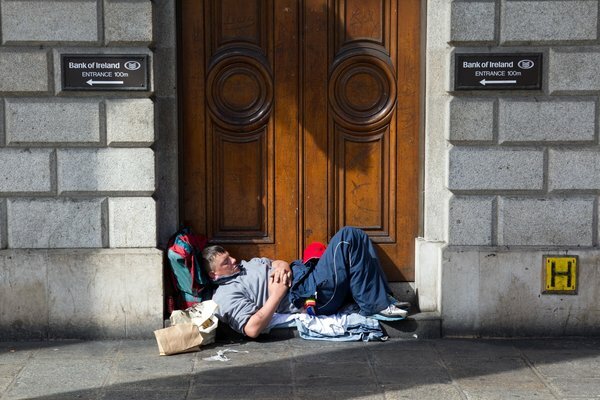 The Irish economy has contracted now for three quarters in a row. Throughout recent recorded history, recessions last on average ten months. This recession is completely different, both in terms of its scope and its depth. We are seeing a massive double-dip recession led by a depressed local economy, which is compounded by the delayed effects of austerity in Europe. Ireland may not win football’s European Championship but when it comes to banking debt we are Barcelona, Bayern Munich and Manchester United all rolled into one with Real Madrid for a bench. Germany may have run Ireland close in the nominal amount of banking debt but when it comes to a proportion of GDP, it is just pennies behind their sofa. For Ireland, it’s the entire house. Ok, we’re small. So how much of the entire European banking debt have we paid? Last week provided a very interesting picture about what is actually happening, not just to the Irish economy, but to the broader European economy, and how the various policy responses over the past few years are affecting us all. The picture is not a particularly pretty one because it shows that money is available to big, government-backed companies and enterprises, but not to small, job-creating entities. The upshot of this Great Recession will be the hollowing-out of the productive marrow of the economy while, at the same time, large, lugubrious entities will probably survive because they have access to precious credit. The story of Ireland is the tale of two sectors. If you are big and have a stream of income – like a big power company with regular payments which can be used as collateral for a new loan, or a bank with paying customers, or even a state with taxpayers – you will get cash. If you are small with a good business model but facing stiff competition and precious few assets to mortgage, you can forget about it. So the good news is that there is plenty of money around; the bad news is it is going to the wrong people – or, at least, not going to the right people.